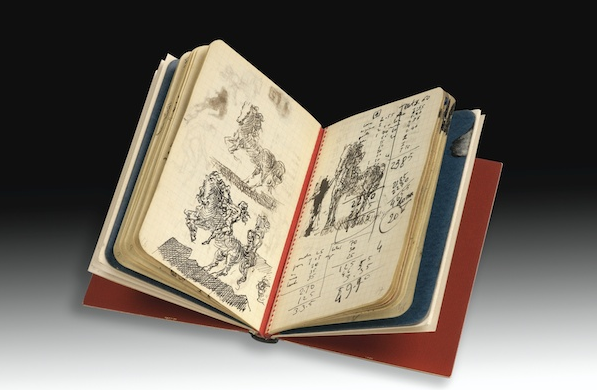 In this week’s exciting auction finds, Sotheby’s Paris will auction off an illustrated diary that belonged to Surrealist painter Salvador Dalí in a sale of Dada and other Surrealist items, April 26-27. The diary is expected to fetch about $57,000 or 50,000 pounds. Its contents come from a period of time when Dalí was involved with Gala, who eventually left her husband to marry him. The diary comes from a collection belonging to a father and son; the collection is believed to be one of the very best of Surrealist art and paraphernalia ever, and could reach $4,550,000 in overall sales. Other items in the collection include 21 portraits of Gala by Paul Éluard, French Surrealist poet and one of the founders of the movement, and other illustrated letters and photography by fellow artists, including Max Ernst, the husband Gala left for Dalí. One special item in the auction is a postcard from Picasso to Éluard, signed by a group of their friends, including Dora Maar, Picasso’s lover. “It is rare to have such genuine insight into the lives of artists involved in both a much-loved movement such as Surrealism and in deeply personal, lifelong relationships,” Artnet writes. Rare books, including a precious Champs Délicieux illustrated with 12 Man Ray works, will also be up for auction, as well as rare and complete magazines and posters by artists of the movement. There are a significant number of items from individual artists like René Char and Lise Hirtz. A number of other works by Dalí will also be for sale. Dalí is considered one of the most popular artists not just of the Surrealist movement but of the twentieth century as a whole. His most famous painting, The Persistence of Memory (1931), exhibits his signature aesthetic of curved edges and melting scenery. His sometimes-strange, often-difficult personality is sometimes remembered instead of his work; he is frequently portrayed as a megalomaniac who considered Picasso to be his only rival. Dalí died in 1988 at 84 years old in his native Spain.